SPRING ASHER and WICKE CHAMBERS (Atlanta, Georgia) are partners of Chambers & Asher Speechworks. They are also columnists for The Atlanta Journal/Constitution. For their work as TV producers they have received six Emmy Awards and the Best of Gannet Award for New Programming. 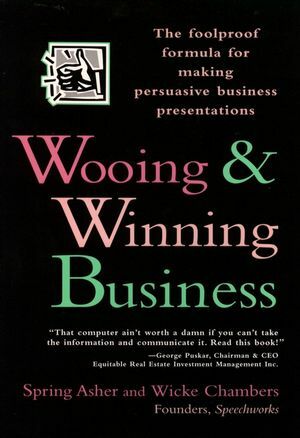 The A to Z guide to making a flawless business presentation. Thirty-three million business presentations are made each day, most of them by people whose number one fear is public speaking. This is the complete guide to creating winning business presentations and making the perfect pitch. It includes a step-by-step guide that makes it easy to persuade the listener, develop evidence that sells, and create visuals that reinforce the message. The authors train several thousand executives each year from organizations including MCI, Georgia-Pacific and UPS. * Offers a foolproof formula: finding the hook, the incentive, and the style to sell anything to anyone. Spring Asher and Wicke Chambers (both of Atlanta, GA) are partners of Chambers & Asher Speechworks, an organization providing communications consulting services to business professionals and executives. SPRING ASHER and WICKE CHAMBERS are principals in Chambers & Asher Speechworks, an internationally known firm specializing in speech and media training. Their column, "Getting Ahead," appeared for four years in the business section of the Atlanta Journal/Constitution. As TV producers, they won six Emmy Awards and the Best of Gannett Award for news programming. Speechworks clients include Alston & Bird, Equitable Real Estate, Holiday Inn Worldwide, Kurt Salmon Associates, Georgia-Pacific Corporation, National Association of Securities Dealers, Deloitte & Touche LLP, MCI, Transamerica Reinsurance, and Turner Broadcasting Systems, Inc.